Internationally, there is a growing argument amongst policy makers and academics that broadening spectrums of young adults are 'at-risk' of various types of material, social, physical, and cultural insecurity. In this way, the traditional identification of transitions from youth to adulthood, marked by points of permanence such as stable employment, are beginning to fray. Through various academic,… popular, and policy literatures, young people today are imagined as being both 'threatened' by social inequality as well as a 'threat' against which our notions of security and social cohesion are constructed. 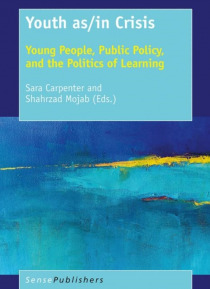 This edited collection includes empirical and theoretical work concerning the relationships between youth/young adults, public policy, and educational research, with its primary focus being new forms of public policy in Canada that, we argue, are emblematic of international policy instruments examining the policy and economic participation of young people. Examining key sites of youth participation, including post-secondary institutions, community-based programs, and work/employment programs, the included case studies examine how young people navigate and learn from everyday experiences of marginalization and violence while at the same time illuminating how these experiences are organized and reproduced through the very institutions that are meant to shape young people's engagement in society.